Melbourne-based social worker Giovanna Mercuri has turned her experiences advocating for clients' mental health into a full-length feature film and a popular television series, with the aim to shine the light on important issues such as bullying and domestic violence. Under her film company Locked-In Productions, Giovanna is in the middle of airing Season Two of her popular television series The Travel Counsellor, broadcast on Channel 31 every Sunday. 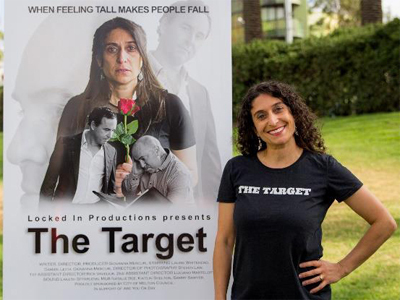 Not only is she currently working on Season Three, set for release in early 2019, but has just launched her second full-length feature film, The Target, starring Damien Leith, which officially opened to coincide with RUOK Day. The Target holds an important message for Giovanna, one that she hopes impacts audiences and makes them take a step back and think. She says the inspiration came from her own counselling practice and she penned abstract storyline using her own experiences. "While conducting counselling sessions, I often come across clients who are suffering from major anxiety and depression, due to various types of bullying," she says. "Upon reflection one day, I realised that this issue of bullying just doesn't seem to go away, or doesn't seem to be getting any better. I decided to make a movie as a different forum to show the serious effects bullying has." "The Target is based on real events of people's lives," says Giovanna. "Filming the movie was an amazing experience and I felt so privileged to have such talented people around me who were just as passionate about spreading the bullying word as I was." Giovanna's other passion project under Locked-In Productions is The Travel Counsellor, currently airing its second season, a drama about a counsellor visiting Australian homes and conducting sessions on a broad variety of issues. "The show is designed to address life difficulties and issues that people face," says Giovanna. "Adele, the counsellor, teaches her clients real strategies on how to handle such difficulties and it is designed to teach audiences solution focused techniques they too may be able to adopt in their lives. This drama is about empowering people to reach out when suffering from mental health issues. The show also teaches friends and families how to respond when they are being reached out to and how common certain issues are." With an extensive background in performing arts, Giovanna has been singing, dancing and acting since she was a child. She has taken her combined education – Bachelor of Teaching (Early Childhood), Bachelor of Education and Bachelor of Social Work – to create targeted programs designed to spark interest, but also provide education and skills. Her debut full-length feature film, Locked In, focused on domestic violence and buoyed up by the feedback from audiences, she hasn't looked back since. "I have been receiving amazing mail about how The Travel Counsellor is helping people feel brave about reaching out to others about their difficulties and mental health issues," she says. "The general consensus is that the series is making it easy for people who are suffering mental health issues to talk about it. Sometimes I feel as a counsellor that no matter how hard I work, how much I try and help people, talking is just not enough. I have found helping people with mental health throughout the movies and series has been a powerful tool. Sometimes people are too scared to talk about mental health – my show teaches them they are not alone." Question: Can you tell us about The Target? Giovanna Mercuri: The Target is about a lady who is saying a eulogy at her husband's funeral after he committed suicide due to bullying. While she is talking, the family and friends of the deceased, listen to the eulogy, and have their own flashbacks of the bullying they are experiencing. This movie shows how different types of bullying affects different people of different ages. It is highly emotional and shows the negative and positive ways people deal with being bullied. There is a very strong message to people who bully others, as well as encourages people who are experiencing bullying to reach out, get help and take action. Question: Why was it important to use The Target to promote mental health? 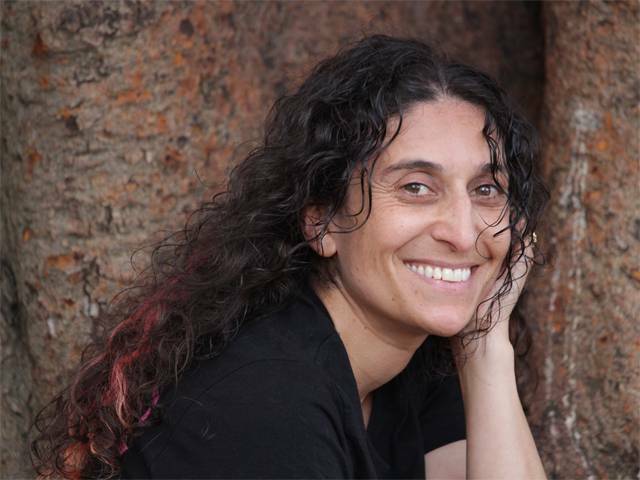 Giovanna Mercuri: In my day job, I am an accredited mental health social worker. I do therapeutic work every day. I have come to a point where I feel I want to promote mental health in a different forum. Whilst watching movies, people are able to relate to storylines, or are given a chance to reflect on their own lives and are also encouraged to stop and take a good look at the people they love around them. Take notice of people and support them where they can. My movie is designed to generate discussion about bullying. Question: What message do you hope audiences take from The Target? Giovanna Mercuri: For the people who bully others to go and get help. Find out why they feel comfort in putting others down to feel better or more powerful. To encourage such individuals to find a new way of feeling better about themselves and deal with unresolved issues. For bully survivors, no one is worth your life or you harming yourself. Action can be taken if you are being bullied. Keep reporting until someone listens and assess your options. Question: Can you tell us about The Travel Counsellor? Question: What do you hope to achieve from season two of The Travel Counsellor? Giovanna Mercuri: Season two is currently airing. It covers topics such as PTSD and teaches how individuals experiencing this condition can manage their low moments. It also teaches how family and friends can be a support. Season two is also covering the topic of domestic violence where a man is getting abused by his wife. Audiences are being taken on a journey of change for the abuser. The show is teaching people how and where they can get help. I like to cover topics that people may not hear much about. Question: Where can we watch The Target and The Travel Counsellor? The Travel Counsellor can be watched live from Melbourne and Geelong on Channel 31 (number 44 on the TV) or livestreamed on Sundays at 10.30pm. The Target will also be airing on Channel 31 on Friday 9th November at 8.30pm. Question: What inspired you to combine your passion for film and television with social work? Giovanna Mercuri: I have been into the performing arts since the age of 5. I have been singing, dancing, acting and playing piano my whole life. I feel happiest in this field. I feel it is a powerful tool to compliment the work I do in mental health also and sends out strong messages visually. Question: What advice do you have us to support family and friends who suffer from mental health disorders? Giovanna Mercuri: When a person tells you they are struggling, don't be afraid. Research the mental health condition they have to help you better understand the condition. There are many suggestions on google on how to help loved ones through bad times. Remember that you won't be able to take away their mental health condition, but you can play a big part in helping them manage it through support. Question: Do you have a daily ritual to support your own mental health? Giovanna Mercuri: I laugh a lot! Smile every chance I can get. I go for walks every night with my family, play piano as a form of meditation and talk to friends a lot. Giovanna Mercuri: I am currently working on Season 3 of The Travel Counsellor. We are in pre-production and ready to start filming the next set of seasons. I have also been writing my next script called 'Fine Line'. This movie will be about grooming. Another sensitive topic. I will also be directing/producing another film in rural NSW next year for another writer, which I am very excited about!